This elephant standing on his trunk is in Barcelona, Spain. He was too wonderful not to share. I whipped out a fast sketch for a friend yesterday, scanning it and sending it to her. She loved it, so I will do a more formal one for her. Some day I may be able to show all of you, but right now it is drawn for an original novel that is still unpublished, and therefore is being kept under wraps. I'm fine with that. I have other things I will be drawing in the next few weeks that I will happily share. Of course, Barcelona is famous for Gaudi sculptures and buildings. This lovely mosaic lizard is one of his many pieces. Of course, the fact that I am drawing means that DH wants to draw also - LOL. He wants to draw a complete scene - foreground character surrounded by background. I've been working on portraiture. But at least it has him thinking about his art again, so that's a great thing. Have a creative day and enjoy the sculptures above from Catalonia, Spain. Happy Leap Year Birthday to my nephew, Michael! It's hard to imagine anyone having that much snow when it's in the mid-70's here! Be safe and stay warm! Be careful out there, my friend. Isn't he marvelous? I love Gaudi's art. I hope the weather won't be too awful for you. Today it's really windy. It wasn't too horrible, but I did spend more than two hours shoveling really heavy and wet snow. I got my exercise today and my back will let me know tonight while I watch Face Off. Spring weather here, and I am so glad of it. I can't imagine snow right now. I hope it melts fast! The Barcelona pictures are beauuuuuuutiful. That's a fun elephant sculpture! Isn't he marvelous? I don't know who did him, but I fell in love with him the moment I saw him. 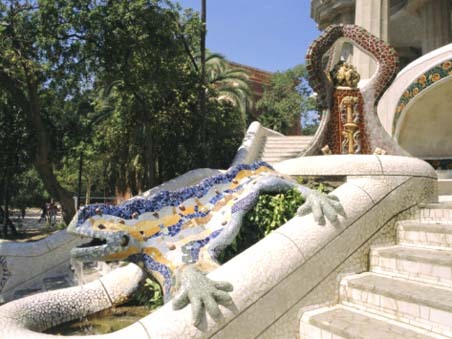 Is that lizard at Parc Guell? Because I believe I have been to that exact spot, and it is wonderful! Yes, the lizard is indeed at Parc Guell. I hope to see it in person one of these days, DH does want to go to Barcelona. Well, we're used to snow up here in the snow belt, but this wet heavy stuff, although the plants will love it, is hell on my back and my snow shovel. Drive safely today. I can remember that snow on ice was the best for taking our beater cars out and doing 360s in the parking lot behind high school,but that was a long time ago. it was great to see your art posted for us to look at. Your box is an amazing piece of art. I would have loved to see it in real life, but at least you've got pictures. Your drawing was exquisite. Thank you so much for sharing your talents with us. Thanks, Ky. Yes, I've spun a few cars out in my time on ice, but today wasn't horrible and traffic was light (meaning that we're not making any money worth anything at the shop today - sigh). The box was a lot of fun to put together. Just Ann Now bought it. That was before we were LJ friends, in fact, that's what brought us together. Thanks for the kind words about my drawing. I really enjoyed doing the illustrations for Binky and it was such a pleasure to pick up my pencils again.